The Zetas predicted during the Washington DC blackout that electromagnetic pulse would be on the increase on the East Coast of the US, and it has arrived. They pointed out how the DC blackout is related to the tense bow the N American continent is sustaining, and this continues. The distress in the rock in this region is shown clearly in a recent Pole Shift ning blog. 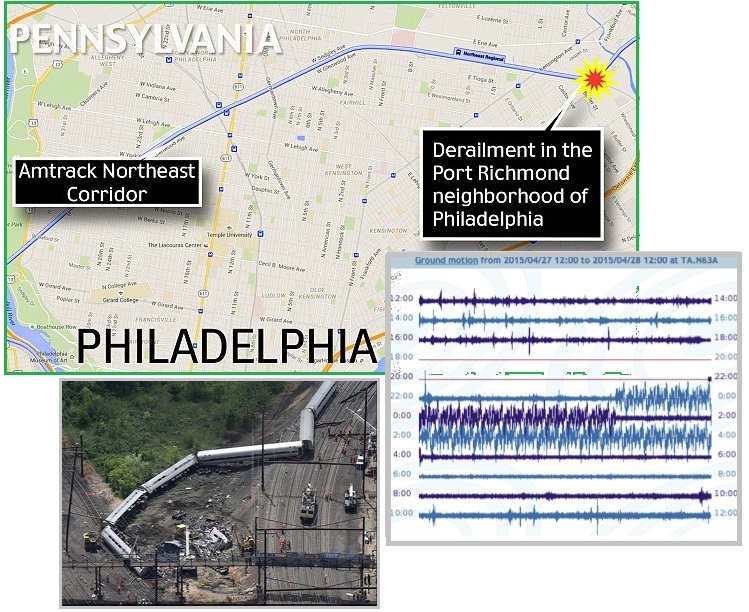 The crash of Amtrak Train 188 in Philadelphia was clearly caused by an electromagnetic pulse. 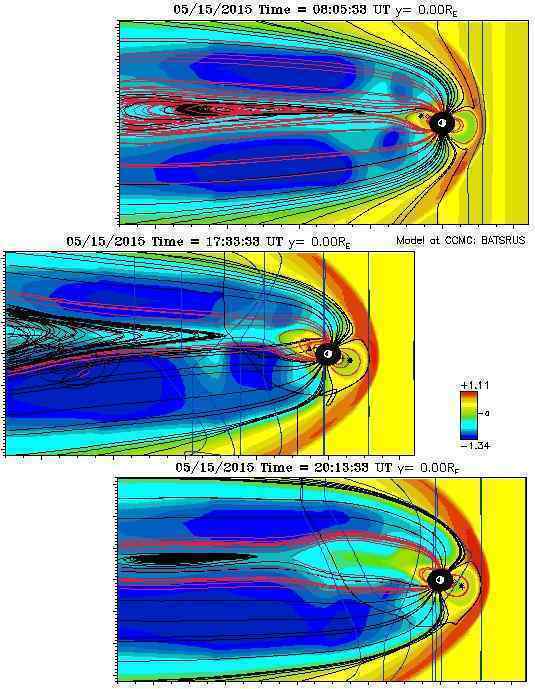 The Zetas cite arcing to the charged tail of Planet X, aka Nibiru, more likely along river beds where the crust is thin and can be pulled taut. ZetaTalk Prediction 4/11/2015: Why was Washington DC affected? It is situated in lowlands, known in the early days of the republic as “foggy bottom” for that reason, a swampland which had to be drained so the mosquito population could be controlled. It is situated at a tear point during a time when the N American Continent is in a taut bow, the bow ends at the Aleutian Islands and the tip of Mexico pulling toward each other. The center of the bow is at San Diego. Follow the line across the continent and you arrive at Washington DC. Chesapeake Bay is an obvious rip point where tears have occurred in the past. Will more such blackouts afflict the East Coast of the US? These electromagnetic pulse episodes have just started, and depending upon their vulnerability, will increasingly afflict cities worldwide. Where normally faulting the pilot or engineer in charge, for this accident a scapegoat is not so easily found. The engineer was impeccable, sane, had his cell phone in his pack and not in use, was not on drugs or drunk, was clearly not asleep as he applied the brakes, and is a highly dedicated and competent train engineer. Vandals throwing rocks and cracking the windshield of the train is likely to take the blame, causing the engineer to fall against the throttle. The cause of the derailment was unknown. Train 188, a Northeast Regional, had left Washington, D.C. The front of the train was going into a turn when it started to shake before coming to a sudden stop. The area where the derailment occurred is known as Frankford Junction and has a big curve. It's not far from where one of the nation's deadliest train accidents occurred: the 1943 derailment of The Congressional Limited, from Washington to New York, which killed 79 people. No drink, no drugs, no medical condition were at play. Bostian's cell phone was also off and in his bag, as required by Amtrak's rules. The train had been traveling at 106 mph before it derailed at a curve on the tracks, where the speed limit is 50 mph. Bostian 32, suffered leg injuries and a concussion and needed 14 staples to his head following the crash. He said he 'has absolutely no recollection of the event' - but said he can hopefully reveal more once he recovers and his memory returns. In addition to the Amtrak train surge, a transformer exploded just days earlier at the Indian Point nuclear power plant on the Hudson River near New York City. Transformers racing to the point of explosion are also a result of electro-magnetic surge, as can be seen in the step-up transformer at the Sayano-Shushenskaya dam in Russia in 2009 and the Itaipu dam in Brazil. A transformer exploded at the Indian Point nuclear power plant Saturday night, briefly sending witnesses into a panic as a massive ball of smoke rose over the Hudson River. 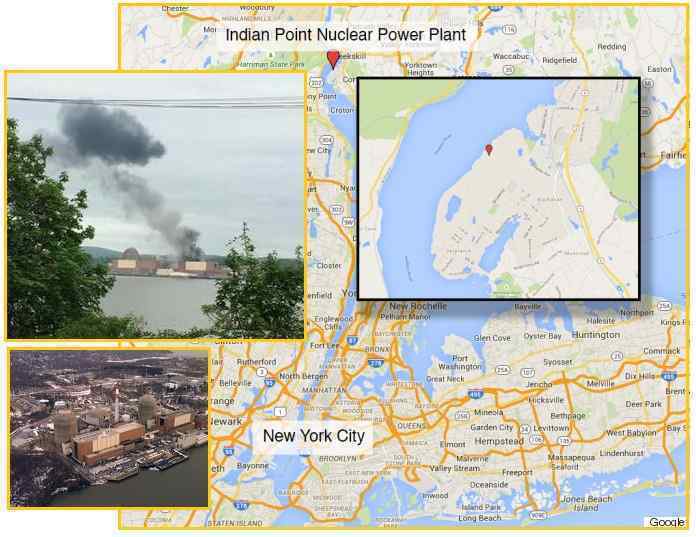 A transformer failure and fire at Indian Point Energy nuclear power plant in Buchanan, New York sent smoke into the air and prompted the plant operator to shut down the impacted unit on Saturday evening [May 9]. The operator did not provide any information on what caused the failure and fire. ZetaTalk Comment 5/16/2015: We have endlessly described the tightening bow in the N American continent and the center of this bow near San Diego. Of course the bursting water mains there are related. We have likewise described the stretch zone accidents in the wide arc of the East Coast of the N American continent, and Philadelphia is centered there. We have explained that river bottoms are where the crust is weak and thus more readily pulled apart during stretch zone accidents. 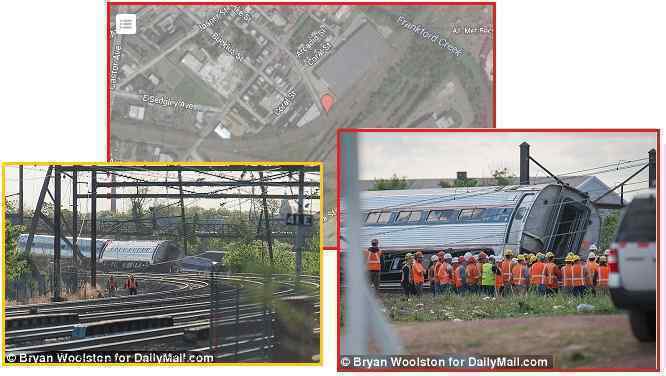 The recent Amtrak derailment was a classic case of what a speeding train will do when the tracks are not where expected. Lowlands, such as the Philadelphia Amtrak curve, are also where electro-magnetic pulse is most likely to occur, as the recent blackouts in Washington DC show. The thin crust is pulled apart more than neighboring rock strata, and thus the electro-magnetic screech is intensified. Lowlands are also soggy, full of water which is a superb conduit for electricity. We predicted that the East Coast would be subject to more electro-magnetic pulse, and this has occurred. Pulse causes brownouts but also surge, as occurred in the Amtrak train and in the transformer explosion at the Indian Point power plant near New York City. Amtrak uses the Acela Express electric train on the northeast corridor run. It can accelerate from 0 to 150 mph in 84 seconds – an increase of 1.7857 mph for each second. Thus the reported increase from 50 mph to 106 within a minute is doable for this train, if the electric surge was pushing it to the max. The passengers also reported that the train sped up just ahead of the crash. The Northeast Corridor is an electrified railway line in the Northeast megalopolis of the United States. Owned primarily by Amtrak, it runs from Boston through New York City, Philadelphia, and Baltimore to Washington, D.C. The corridor is used by many Amtrak trains, including the high-speed Acela Express. 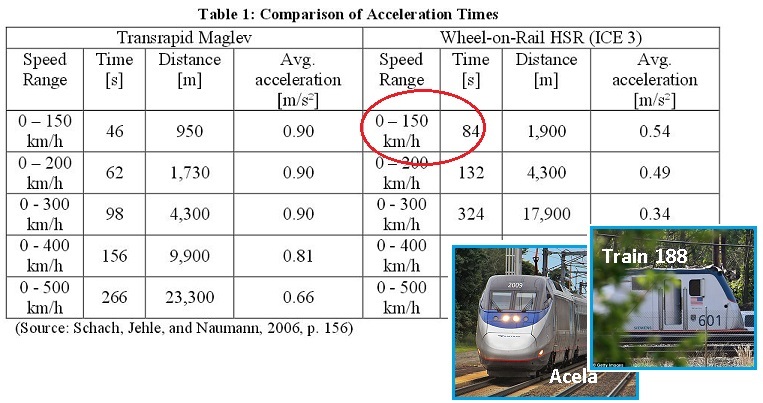 According to Schach, Jehle, and Naumann the ICE 3 wheel-on-rail high-speed train needs 324 seconds to reach a speed of 300 km/h (186 mph) while the Transrapid maglev reaches the same speed after only 98 seconds. At 43 seconds before the end of the video, the train's speed exceeded 80 miles per hour, Sumwalt said. Thirty-one seconds before the end, the train was going over 90 miles per hour, and 16 seconds before the crash, the train was going over 100 miles per hour. What is still unknown is why the train was speeding in the first place. Was it manually caused by the engineer, who is expected to note speed restrictions on the route, or was another factor at play? Increased intensity in the bowing of the N American Plate is in evidence elsewhere too. The Philadelphia Amtrak surge happened on May 12, while simultaneously a fjord in Norway had a huge landslide. Just days before on May 9 the center of the bow near San Diego was in the news as a result of a monstrous water main break. Per the Zetas, draw a line from the water main break through the Amtrak crash to the fjord landslide and you can see the Earth plate interaction. A water main described as "colossal" break flooded streets in the Beverly Grove area of Los Angeles Tuesday morning [May 12]. The pipe ruptured about 5 am. Tuesday morning's incident follows a West Hollywood water main break over the weekend, described as a "Poseidon adventure," that sent "massive" amounts of water into streets and parking garages. 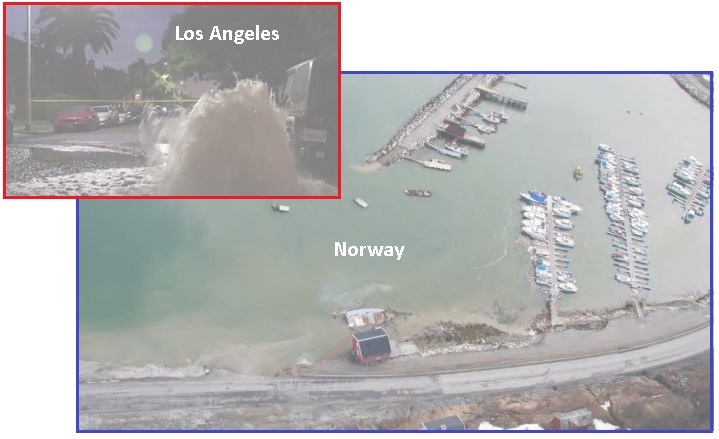 This past weekend, a rare underwater landslide in the town of Sørkjosen, Norway, resulted in extensive damage to a wharf, some buildings, and a sea wall. Local authorities have shut down a major road for fear it too could be sucked into the sea, resulting in a 435-mile (700-km) detour. ZetaTalk Comment 5/16/2015: As N America tightens, it affects the North Atlantic Rift, which is pulling apart as anyone observing the volcanic activity in Iceland can determine. Thus support for the continental shelf off-shore from Norway and Europe is weakened, and droops. That these stretch zone accidents are occurring almost simultaneously shows the inter-relationship of these plate movements. To those who have been following ZetaTalk these stretch zone accidents are not a surprise, nor will they be surprised at what is to follow shortly. The New Madrid zone in N America is awakening. It is not just commercial enterprises like airplanes and electric trains and hydroelectric dams that are experiencing electromagnetic pulse. The average citizen also is affected. If the Amtrak crash happened on May 12 and the LA water main break happened on May 9, a homeowner in the Midwest noted a surge in her home on May 11. Storms or lightning strikes were not the cause. On Monday, May 11th, we had a surge of power through our house so great that it magnified the brightness of our lightbulbs tenfold. The lights and one of the circuits proceeded to burn out, and the surge fried anything that was plugged in—as a strong burst of magnetic energy would. Even a surge strip did not keep the cable box from being fried. This type of situation has never occurred in our home in over 50 years. The event occurred at a little after 13:00 pm CST, or 18:00 UTC. No source was found for the surge, only a fried wire, which had caused a burning smell in the home. Certainly a malfunctioning wire, more than likely fried by the surge as well, would not cause a surge in power, but a reduction in it. Space was relatively quiet, but the magnetosphere was fluctuating widely. 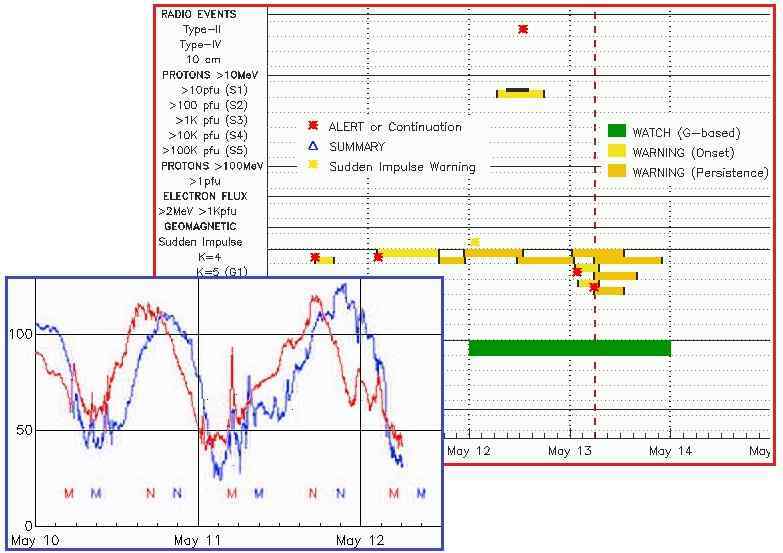 Indeed, the magnetic blast from Nibiru was so intense that for 3 weeks, from May 1 to May 15, BATSRUS was shut down completely. When it finally did come back online, the distress, in red around the bowshock, was clear. This was noted by a dedicated Pole Shift ning member. This is not solar activity. After 15 days with approximately 300 hours of missing data, it appears the uninterrupted BATSRUS RCM image feed has resumed. Honesty about the cause of these disasters is sneaking into the discussion. As the Zetas point out, the media can lie, lie, lie to the general public but engineers are not fooled. Note the posted tweet after a blackout at Deansgate mall in the UK. Again the word “surge” was used and the explanation given by a fireman involved magnets. The cut was said to have been caused by an electrical surge. People in the area say "Smoke was coming from the electric cupboard from 86 Deansgate when the power surge hit. 4 fire engines responded to the call". Jade Barrow is a receptionist at 86 Deansgate, and said the whole building shook. She said: "The firemen explained to me that an electrical surge is like 2 magnets hitting each other. That's why it all shook because of the force." ZetaTalk Insight 5/23/2015: Air France 447 in 2009 and Malaysia 370 and the recent Germanwings A320 are in the news because they impact the airline industry, and the blame thus placed elsewhere. To date, pilot suicide, storms, and bad pilot judgement have been used, and how is the public to know otherwise? Electric trains such as the Disney Monorail and DC Metro crash incidents in 2009 and the recent Amtrac 188 go into investigation while talking heads murmur about safety devices or track maintenance or mechanical failure, which ultimately get the blame. The plight of the Rohingya people, unwanted for religious reasons in Bangladesh and Burma, is not new. The boat people, stranded at sea and unwelcome, was covered in Issue 299 of this newsletter in 2012. Now this issue is back in the news, with migration firmly refused by Malayasia and Indonesia as well as Burma (also called Myanmar). 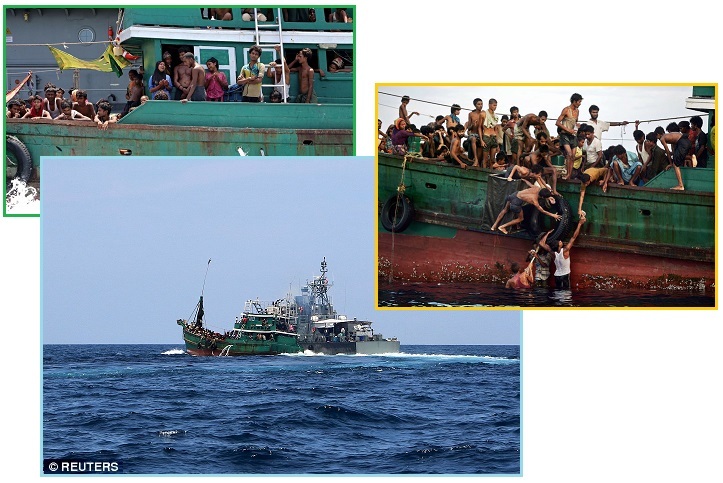 Fearing arrests, captains tied to trafficking networks have in recent days abandoned ships in the busy Malacca Strait and surrounding waters, leaving behind their human cargo, in many cases with little food or water, according to survivors. Malaysia, which is not a signatory of international conventions on refugees, is host to more than 150,000 refugees and asylum seekers, the majority who are from Myanmar. The Malaysian Prime Minister said his country already has 120,000 illegal migrants from Myanmar and the 'humanitarian catastrophe' was a global issue which needed to be resolved by the international community. Thailand is hosting talks on May 29 for 15 countries to discuss the crisis. They were carried or staggered ashore, some paralysed by malnutrition, others little more than walking skeletons, burnt and dazed from weeks at sea on boats the UN has called “floating coffins”. Since 1982 the group has been refused citizenship by the Burmese government, which denies their existence. 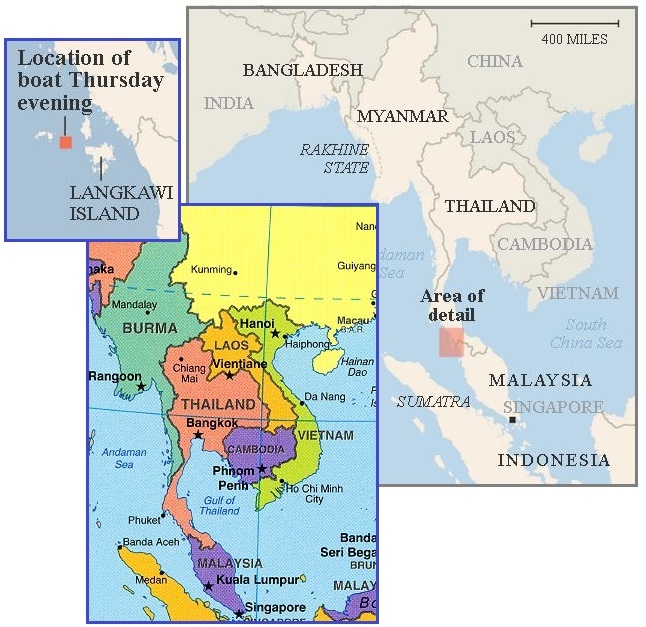 The Thai military, alerted to their presence by The New York Times, provided some water and food, then assisted the boat’s departure farther out to sea. An estimated 6,000 to 20,000 migrants are at sea, fleeing ethnic persecution in Myanmar and poverty in Bangladesh, while countries are pointing fingers at one another and declining to take responsibility themselves. Most of the migrants were thought to be headed to Malaysia, but after more than 1,500 came ashore in Malaysia and Indonesia in the last week, both countries declared their intention to turn away any more boats carrying migrants. Is there a solution? Unfortunately for this region of the world, the issue of migrants afloat is only beginning. The region will be sinking, steadily. India is being pushed down as the Indo-Australian Plate is pushed under the Himalayas, and ultimately India will be devastated during the hour of the Pole Shift. 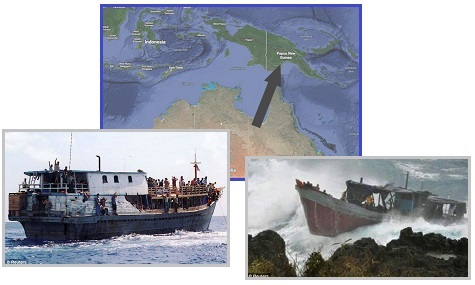 The Sunda Plate is still sinking from the 7 of 10 plate movements, but any attempt by countries inundated by sea water to migrate to Australia is rebuffed. Australia has made arrangements to send boatloads of immigrants to New Guinea, another Commonwealth country, as detailed in Issue 407 of this newsletter. ZetaTalk Comment 6/16/2012: Will some migrants be left adrift at sea from countries sinking during plate movements, and during the harsher flooding to come during severe wobbles and the Pole Shift itself? This will absolutely be the trend. Boat cultures, floating cities of desperate refugees with nowhere to go, will become common in SE Asia and India. India and other lands on the Indio-Australian Plate being pushed down will find their sinking lands steadily worsening. The boat people, they will begin to be called, as this will reflect their life. Most will die at sea, without fresh water or the means to collect a meal from the sea. But some will fish and barter for vegetables in land based settlements. Matters have if anything become more grim. The Rohingya peoples were only rescued because the New York Times became involved, publicizing their plight. The Zetas predict that brutal regimes, like the current Australian ultra-right government, will engage in more brutal practices. ZetaTalk Prediction 8/23/2014: India is already at starvation levels among much of their people. And if the populace becomes aware of steady sinking, there’s going to be panic. And there certainly will be rioting in cities to rush the enclaves of the wealthy. So to what extent will the government rise up and just blow people away? People will try to clamor into boats and go elsewhere, and will be dying at sea. Countries such as Australia will sink their boats, blast a hole in the boat, and all those Indians will be bouncing around in the waves and drown and nobody will hear of this. Australia is already brutal with immigrants, and its one step away to being heavy handed with their citizens.